Hello Verve fans!! Marisa here with this month's Diva Dare entitled "Pile on the Sweetness". 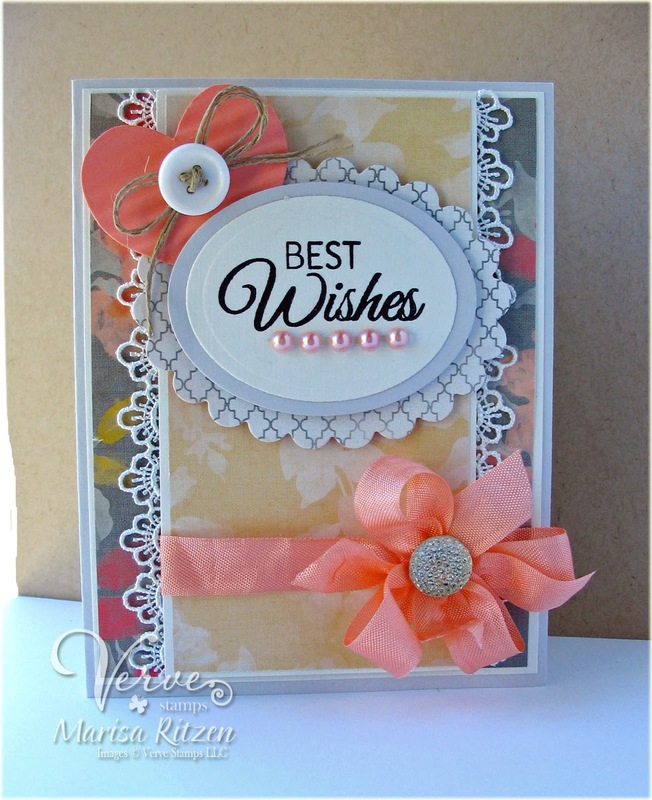 This month's dare pays tribute to Diva Andrea (Ewen Style), and Diva Christyne (Stampin' with Sugar). Both Divas are known for the wonderful way they can add layer upon layer on a card. So what we're daring you to create this month is a card using lots of layers. If you want to kick this month's dare up a notch, you can add a flower cluster as per Diva Andrea, or go with a "sweet" theme as per Diva Christyne's blog name "Stamping with Sugar". These are not required elements, but fun options should you wish to use them. Just remember to use at least one Verve product on your creation! I used My Mind's Eye In Bloom paper pack and Diva Maureen's Viva La Verve sketch for my card. A touch of lace and a sentiment from Love Story that was generic enough so I can use this card for multiple occasions. Couldn't resist the heart on the sketch so out came the Wavy Hearts die and my crimper. I have a total of nine layers so I think I'm good for the dare. Deadline to link your cards is 8PM Mountain on Wednesday, August 28th. Entries must be new (posted 8/9 or later), include at least one Verve product, include multiple layers, and be linked up to the linky widget by 8pm Mountain on 8/28/13. During this month's Diva Dare, there are 2 prizes up for grabs! Win a $40 Gift voucher to Verve Stamps! Take our "Pile on the Sweetness" Dare and link up your card (created August 9th or later) to the linky widget below to be eligible to win. One participant will be randomly selected to win the gift voucher. You can enter as many times as you like, but each card needs to be in a separate post. Win a set of your choice! For another chance to win some new Verve, leave a little comment love on our design team's "Pile on the Sweetness" Diva Dare posts! One lucky commenter will win a Verve stamp set of his or her choice, so be sure to tune in each day! Comment deadline to be entered in our prize drawing is August 28, 2013. Winners will be announced on August 29, 2013.